It is a soggy vintage in Valpolicella and the Veneto generally. Rain, rain and more rain on through harvest. This is problematic and also a bit ironic for wines like Amarone, Ripasso della Valpolicella and Reciotto that are defined by dry not wet — that are made with grapes carefully air dried for weeks or months before being made into wine. Not that all the news is bad — some winemakers told us that grapes from higher elevations and steeper hillsides held promise for good quality. 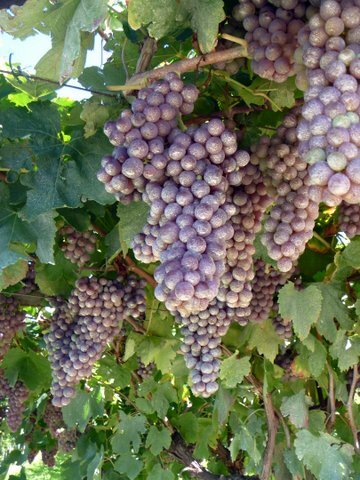 Others noted that the old fashioned looking pergola-trained vines were doing better (better air circulation) than the conventional Guyot-trained vineyards. Lots of concern about mildew and rot, and some grapes, like the ones pictured here, were almost blue, we were told, from Bordeaux mixture spray (an approved organic anti-mildew treatment) they had recently received. That’s Where the Money Goes! Amarone and Ripasso are key elements of the upmarket Valpolicella premiumization strategy. Although the more popularly-priced wines of the region — Valpolicella, Valpolicella Classico, Valpolicella Superiore — are often delicious, they are light in body and even sometimes in color in a world that seems to be searching for deeper, richer wines. Luxurious Amarone, made from those air-dried grapes, fits the bill very well and has established a strong global following. When I told my friends I would visit Valpolicella, “Amarone!” was the uniform initial response. Ripasso, which is made by refermenting “ordinary” Valpolicella on the pressed skins left over from Amarone, also has a strong following among those who see it as a more affordable “baby Amarone.” It is sometimes a better wine and might even be a more profitable wine for some producers, but you can’t make Ripasso unless you have made Amarone, so they are joined at the hip. Amarone and Ripasso are the money wines of Valpolicella, even if a bottle of good Valpolicella Classico Superiore is difficult to beat paired with mushroom risotto. High prices are an imperative here because of high costs — high vineyard valuations (€400,000 per hectare in some areas, we were told), high grape tonnage prices, and expensive long aging periods in tank, wood and bottle before release. Plus the obvious volume losses that come from the air-drying process. This makes the rainy vintage even more problematic. 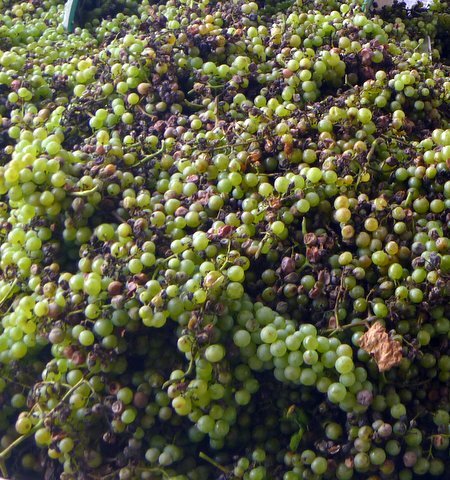 Quantity will be down for those producers who carefully sort through the grapes, but quality is likely to suffer, too. How much? Enough to drag down price? Enough to damage the wines’ and region’s reputations? A thin veneer of confidence about quality masks some real concerns and fermenting disagreements. Bertani, one of the big players in the game, announced that they would pass on Amarone Classico this year rather than accept lower quality. A producer I cannot name revealed during our visit that he had that morning signed a contract to sell off his Amarone wines to the bulk market rather than release an inferior product under his own label. No Amarone, maybe no Ripasso, no money wine this year … for some. How can someone just walk away from their money wine? Well, the first answer is that wine is agriculture and Mother Nature often makes the call for you (something that growers in Valpolicella already know since they live an area with frequent sporadic catastrophic hail storms). A deeper reason is that for some producers a year without Amarone might actually be a good thing. The Amarone boom of recent years was always worrying to those of us familiar with busts. Maybe a year without Amarone would help rebalance supply and demand? Given the soggy year and what may well be a substantial inventory over-hang, a case might be made for treating Amarone like Port and “declaring” a vintage in the best years while focusing on other types and styles when quality is in doubt. Amarone, like Vintage Port, is a luxury product and you can see the logic of not wanting to undermine its reputation. Given the choice, I think some producers would give the “Vintage Amarone” idea a try although others would prefer a half-way measure — none of their finest Amarone, but maybe still produce some lesser wines. Hmmm … I wonder if that would really work? But expanding the focus beyond Amarone to other wines might have some benefits apart from the obvious one of supporting quality. More attention to the conventional Valpolicella wines would be welcome if the broad trend I sense of a shift to lighter and more balanced wines is correct. And then there are the innovative IGT wines that I talked about in a recent column. When I asked one winemaker why he was making a proprietary IGT wine in addition to his DOC and DOCG traditional products, he replied honestly that it was an upmarket thing — he wanted to have something that wasn’t Amarone or Ripasso for his Valpolicella customers to move up to. Lots of room for great wines in this category, without the restrictions of the DOC rules. Lots of opportunity for interesting products in “non-vintage” years. But passing up on the money wine in off years is a luxury that not everyone can afford. We saw many new and impressive wineries that may well have been built on the expectation of Amarone-style returns. If the business model is built on Amarone, a bad year (which would be a year without Amarone) could be devastating. Negrar makes many wines today under its own label and the premium Domini Veneti brand, but for obvious reasons its identity is tied to Amarone. It is difficult to imagine that it could pass on an Amarone vintage for any reason and so certain tensions are inevitable between those who for one reason or another cannot or will not miss an Amarone vintage and those who for different reasons are willing to take the risk. Our visit to Cantina Valpolicella Negrar showed their focus and continuing commitment to Amarone. A line of single-vineyard wines, Domini Veneti “Amarone Espressioni,” were presented at lunch. The five wines were as different as their origins — I liked the wines from higher elevation vineyards the best, although I think I might actually prefer the multi-vineayrd blend that I tried with dinner the next night. So what’s in the future? More rain, if past is prologue, but it is difficult to say beyond that. Valpolicella is in a way a victim of its own success. Great wines that earn a premium in the market — no doubt about it. But also expensive wines that play in a very competitive luxury wine league along with heavyweights like Barolo, Brunello and Barbaresco. Finding the right solution is no simple matter. The people we met are smart and while they will disagree about how best to move forward I’m pretty confident that they will find a way to sustain the good thing that they have got and maybe even kick it up a notch as they have done in the past. In the meantime, pray for a break from the rains!